So, they say I need a list. Because, apparently, readers love to subscribe to lists to get updates and whatnot from their favorite authors. At any rate, I now have a list plus I have a very special unlimited time offer for you today only, and also tomorrow, and pretty much every day until you take me up on this offer or I get totally bored with it and decide to call the whole thing off. So, you better act fast. Or slow. Depends on how long you think it will be before I get bored. Oh, you want to know about the offer? Well, here it is . . .
What I am offering you here today is a non-exclusive, wide open invitation to join my mailing list. Now, I fully expect this list to grow to as many as four or five subscribers, so you better get in quick so you can be among this small, very special group of very special people who want to be exposed to extreme lameness and pretty much not learn a thing about anything. Now, I know what you’re thinking. You’re thinking, Dan, I can subscribe to your list anytime. Why should I act now? That’s a good question, my friend. Well, as a new subscriber to my list, you’re entitled to some very special bonuses! 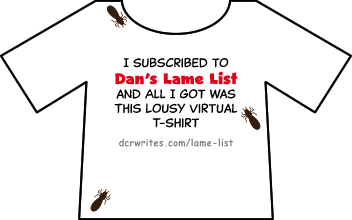 The first very special bonus for subscribing to my list is a free virtual t-shirt! Go ahead and right-click that baby and save it right to your hard drive. You don’t even have to subscribe first! I’ll trust you. But, wait, there’s more! If that virtual t-shirt just isn’t enough, you also get fries with that! Mmm. Virtual fries. They look so tasty! Just don’t lick your screen, unless it’s really dirty, but even then it’s probably a bad idea. Anyway, before we move along, go ahead and right-click that one and save it to your hard drive too. That one’s a keeper. Again, I’m trusting you and not making you subscribe first to get your goodies. Now that you have your goodies, it’s time to actually subscribe to my list. But, if you are anything like me, you are very selective about to whom you give your eMail. You don’t just give it out to anyone! You only give it to your family, your closest friends, your business associates, Amazon.com, Facebook, Twitter, LinkedIn, Google, random forums on the Internet, your distant cousin who found you online and wants to get back in touch, PayPal, your neighbors, your co-workers, every giveaway opportunity you can find, your bank, your electric company, Red Robin, Coke.com, contest entries, fan clubs, your fitness club, your bridge club, your real estate agent, your credit card companies, Groupon, Disqus, the David Tennant Fan Club, author John L. Monk, your lawyer, Skype and YouTube. I mean, it’s not something you give to just anyone! I want you to be absolutely, positively convinced, beyond a shadow of a doubt that joining my list will be the best decision you make all day or, at least, the best decision you will make in the next ten minutes. I don’t know what your day is like and what kind of decisions you will be making, so it’s hard to take a guess here. So, how can we close the deal here? What if I promise you a newsletter every month with new stories and stuff? Well, probably every month. Er, maybe every month. We’ll see. But, it’s free, so don’t get too picky about how often it arrives. It’ll be a handy dandy PDF you can read on your computer, transfer to a tablet or print and read while you’re taking a bath or whatever. Just don’t tell me where you’re reading it. I probably don’t want to know. I’ll just be sending you the link to the file each time so as not to clog up your eMail. You’re welcome. Are we good? I hope so because I’m out of ideas here and it’s almost supper time as I write this. So, subscribe or don’t subscribe, it’s all up to you now. The form is below . . .
P.S. There is no P.S. Sorry.